CSCTR congratulates the 2019 Early Career Development Award recipients. This award provides the recipient a $10,000 grant to be used to supplement any combination of salary and/or lab support. Apply for an ECDA! 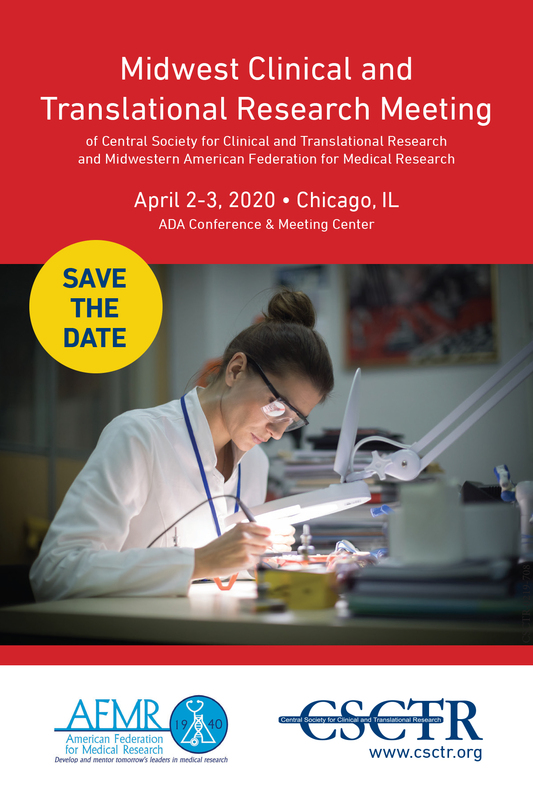 The Central Society for Clinical and Translational Research is one of the oldest academic medical societies in the Midwest. Our Vision: Promoting a vibrant, supportive community of multidisciplinary, clinical, and translational medical research to benefit humanity. Our Mission: Develop and support communication, collaboration, and career development within a community of medical researchers in the central U.S. and beyond. Members are academic leaders of medical schools in the Midwest however, CSCTR has active members throughout the U.S. and Canada. The society publishes the monthly Translational Research: The Journal of Laboratory and Clinical Medicine and holds an Annual Meeting that contains cutting-edge papers, posters, lectures, and state-of-the-art forums. You are encouraged to apply for membership. We encourage you to JOIN CSCTR! Visit the Membership section for full details.